Hello Everyone! Hope you all had an absolutely wonderful Christmas with your family and other loved ones yesterday. I know I did! I got a lot of lovely gifts for Christmas and I am so grateful so I will be doing a 'What I Got For Christmas' in a couple of days so if you are interested in seeing that then let me know in the comments below. Today I thought that I would show you all my favourite bloggers of 2014. Now this was meant to be a part of my Top 10 Favourites series but I just love all these girls so much that I had to include all of them! There are sixteen spiels here meaning that this post won't be a short one so grab a cuppa and enjoy! I have already mentioned the lovely Kayleigh in a blogging faves post before but I had to mention her first on this post as throughout this year she has inspired me so much. I absolutely love her blog and writing style, her photos are just incredible and she is an absolutely lovely girl. Definitely someone I can see myself getting along with whilst I'd reading her posts. She's also doing a fab giveaway on her blog at the moment to so head on over to enter! Megan's blog is one of my all time favourite blogs I've ever come across and she's such a lovely genuine girl as well. I've spoken to her quite a lot this year and hope to continue that into 2015. Whenever I've been feeling a bit down she's always sent me a tweet to cheer me up and I've really appreciated it. Not only is her blog amazing but she also experimented with youtube this year and her content is always absolutely brilliant. Definitely check her out. I absolutely love Hannah and her blog. She has super amazing style and her posts are always filled with brilliant information and gorgeous photos. I always go to Hannah's post to look for some fashion inspiration as we have very similar tastes. Her blog design is also one of my favourites. Corrie has definitely been amongst my favourites this year. These past couple of months we have exchanged numerous tweets with each other and I just absolutely adore her. I think she is such a funny little character and that reflects in her blog posts. I can't help but have a chuckle at them sometimes. The same goes for her tweets. Definitely a blog you should all be following if you're not already. The lovely Alix is the author behind this blog and I absolutely adore her. She seems like such a sweet, down to earth girl. I absolutely love her blog as her photos are always amazing, her writing style is incredible and she just makes me incredibly jealous for how well she can pull off a red lip too. Again with have very similar tastes in fashion and beauty products so her videos and blog are always something I turn too if I am looking for a certain thing. She's just a lovely person to watch and listen too. I absolutely adore Suzie and her blog. She also has an adorable puppy called Nala who is just so cute. Like with Alix, Suzie is just such a lovely person. Her writing style and photos are always incredible and I love how much effort she puts into a post and her videos on youtube. Definitely one of the most down to earth youtubers there are. The gorgeous Katie Snooks from the talent company Gleam is the author behind this blog and I absolutely love her writing style and her photos. She always draws me into her posts everytime and I always end up buying the product she recommends because she makes it sound that good. Definitely a blogger to check out. She also has a youtube channel. I've always known about Meg through other bloggers but I never actually really read her blog properly until recently and I smacked myself on the hand once I'd realised the sin I commited. She's absolutely gorgeous and there's just something really warm about her when you read her posts or watch her youtube videos. Her make up is always flawless and I absolutely love her style. The beautiful Megs has been one of my biggest inspirations this year. Not just for blogging but for life itself. She has helped me so much when it comes to accepting your body for what it is and to be happy within your own skin. She did a video on youtube about it a couple of months ago and it is absolutely amazing. She's been through a lot lately and still manages to have an absolutely gorgeous smile on her face. Definitely someone to check out. She is unbelievable. I do love Beth from Miss Beauty Obsession! I think she's such a lovely girl and her blog is so helpful and she always writes amazing posts with fab photos. I also love the fact she speaks her mind and isn't afraid to show how she's feeling. Definitely a blog I'd highly recommend checking out. She's absolutely lovely. I came across Victoria's blog a few months ago and just absolutely fell in love with everything about it. The name is what drew me in and everything from the design to the photos to her writing is what made me stay. We have very similar tastes. I love vintage shabby chic styles as well so her blog is literally a perfect read for me. She seems like a lovely girl and I would highly recommend her blog if chabby chic and vintage things are your style. If you are not already reading or following the gorgeous Andrea's blog then where have you been and what have you been doing. She is literally amazing. Her photos are literally the best in the blogosphere and I really do not know how she does it. Her reviews are always spot on and she literally is the loveliest girl ever. Definitely check out her blog if you haven't already. I mentioned Em in my previous 'Share The Love' post but her blog is definitely one I've been loving throughout the whole of 2014. I think she is absolutely lovely, her writing style and blog posts are always incredible and she has a body I would literally die for. She's definitely inspired me to work out more throughout 2015! Em also has a youtube channel but I will be honest I tend to read her blog a lot more however, the videos I have watched she comes across as the most genuine girl ever! My favourite lifestyle blog ever ever ever! Becky is absolutely amazing. She is a stunning girl and her blog reflects her whole personality. She blogs about literally everything from her life, to her boyfriend, to food posts and they are all absolutely beautifully written with stunning photographs. Next to Andrea, Becky's is my favourite blog for photography. If you're not much of a beauty girl and like a blog with a lot of variety then Becky is your girl! The lovely Katie is the author behind this wonderful blog. I absolutely love Katie's blog as I just find it such an easy read. Katie is one of the few bloggers I know that gets straight to the point of her post without rambling on too much. Not that there's anything wrong with rambling, I do it all the time haha. Katie also seems like a very lovely down to earth girl. I love scrolling through her blog. How anyone could not love the beautiful Victoria from InTheFrow is beyond me. I definitely couldn't do this post without including her in it. With her amazing style, dazzling purple hair and beautiful blog and youtube videos she is definitely someone who I have grown to love this year. She is just so beautiful but at the same time seems so down to earth. She has recently graduated with a doctorate degree which I think is pretty incredible and I have loved reading about her journey through this and also through other parts of her life too. Definitely worth checking out! So there we have it. 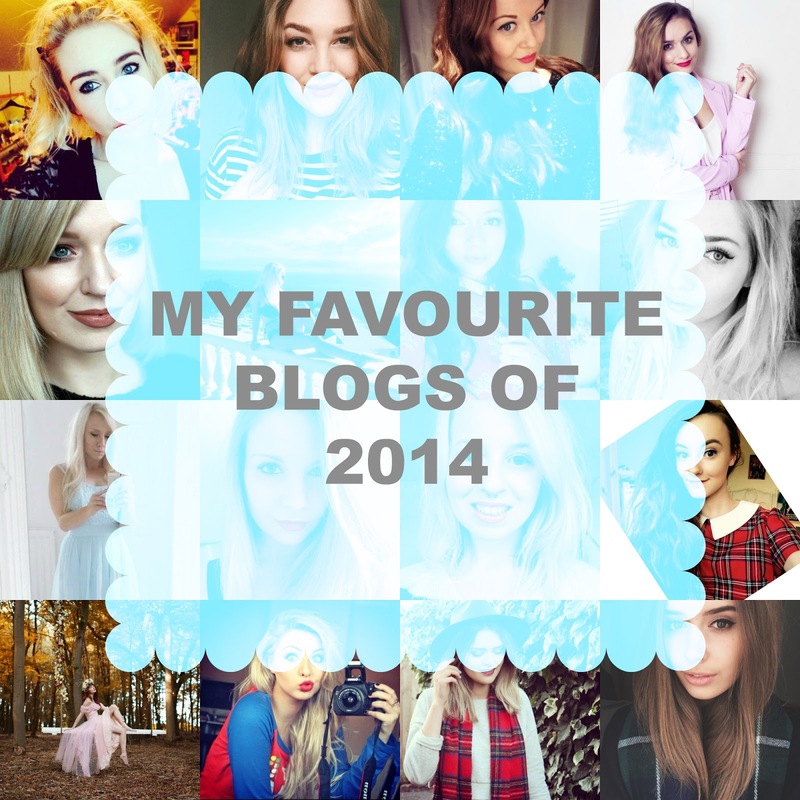 All my favourite bloggers of 2014. All these girls are absolutely incredible and absolutely lovely and so down to earth. I'd highly recommend checking out their blogs. I hope that I'll continue to get to know some of these girls in 2015 as they have all inspired me so much this year and have picked me up when I've felt like giving up on blogging. If you haven't read any of these blogs please check them out. You won't regret it. What are your favourite blogs of 2014?